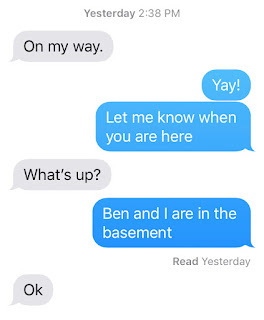 Like many teens, Max is into texting. He does it from his new Apple Watch. We got it so he'd have another form of communicating, and to track his bus trips to and from school (Find My Friends has also come in really handy for his neighborhood excursions). Phones don't work well for him, because he has trouble simultaneously holding onto one and navigating the screen. Max uses the pre-populated phrases and words that crop up, so his texts are pretty simple. 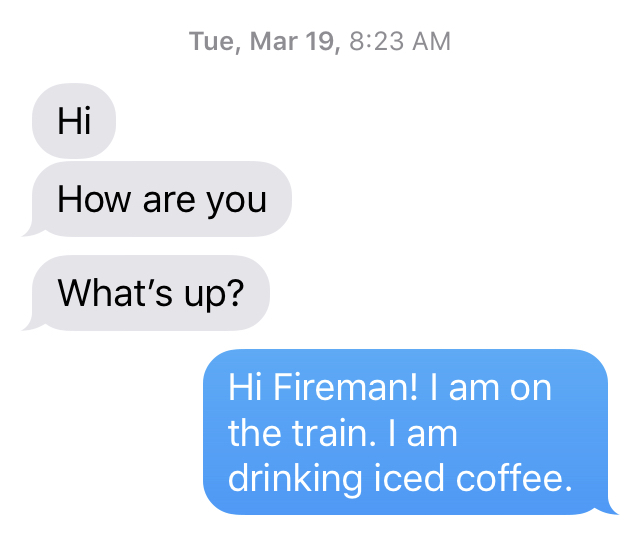 He likes to get in touch in the morning on the bus and on his way home, although there are times when we are sitting together in the living room and he'll text me. Max is also fond of calling from his watch. If I'm in the car and go to call Dave, he'll insist on doing it from his watch. When he and Dave are out having one of their eating adventures, he'll call to report on what they're consuming. He likes to check in with his grandparents and my sister. I am utterly enchanted. 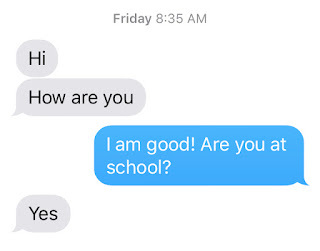 To be sure, it's not mind-blowing that Max is texting—he's a competent boy who loves to engage with everyone around him. It's the part of my heart that still harbors the anxiety from the early years, when he couldn't say the words "no" or "yes" or shake his head no or yes and I worried so much about what the future held for him. Now I am in that future and Max communicates in all sorts of ways with devices I couldn't have even imagined back then—a WATCH that MAKES CALLS—and I am so, so grateful, for the technology and the ability. The only thing that frustrates Max is that the watch can't translate his speech to text, because it can't quite discern what he is saying. Maybe someday, soon, it will. The Voiceitt people are working on the world's speech recognition technology designed to understand non-standard speech, and it gives me great hope. Dave and I were talking about the watch last night. Our friend June had gotten Max a red band for it, and Max was thrilled. 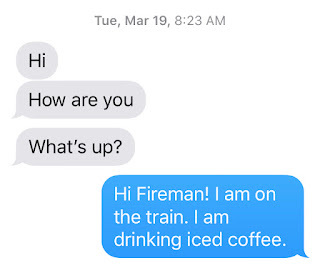 Dave showed me the texts Max has been sending him and it turns out that Max texts him way more often. Oh, I totally missed that! Thank you so much. Technology is amazing! PLEASE blur the phone number from the screen shot!!! Hi Louise! I'll take some pics of the watch and a video of Max using it, and post it on the blog in the near future. Awesome—Ms. 23's independence and your idea of free pedis! Thank you for this. You give me so much hope for my Max. I am going to look into an Apple watch. Right. Now. I hope it works for your Max! FYI, we got ours through our mobile phone carrier, a better deal than going through Apple.